How to tackle unfair selling practices of banks? HomeBankingHow to tackle unfair selling practices of banks? A plethora of financial products are available today suiting our various financial goals and risk appetite. More the choices, more the confusion. Banks have become a one stop shop for offering all kinds of financial products and services besides accepting deposits and lending money. While the objective of the RBI is to enhance the wider reach of financial products by appointing banks as intermediaries, it has given rise to a menace – rampant misselling. With bank employees being offered performance linked incentives, the question of potential conflict of interest is always existent. It has become a common practice, rather malpractice of banks to pitch financial products to customers which they don’t really need. Misselling is widespread in the bundled products space, especially in the case of home loans, bank lockers, debit card and credit card. Take the case of bank lockers. Opening a fixed deposit is usually shown as a precondition for the allotment of a bank locker. Similarly, to open a PPF account, opening a savings account with the bank is represented to be mandatory. Another common example is that of home loans. Rather than the core lending product, banks promote the home loan package which is bundled with life insurance. The customer is required to pay a lump sum premium and is added to the home loan amount to be paid along with the monthly EMI. The buyer does not know how much exactly he has paid for insurance. Further, the cover reduces with the payment of the principal amount. If you switch the loan to another bank or foreclose the loan, the cover will expire. Such home loan protection plans are costlier compared to pure term insurance cover. These are pitched tactfully so as to give an impression that life insurance is mandatory to buy along with the home loan product. Customers are not aware that they have an option to refuse bank for insurance and there is no compulsion to buy it as per RBI rules. Some even fear that if they do not buy the bundled product, it might create a problem in their home loan application. In some rare cases, customers are not even aware that they have been assigned a life insurance policy along with home loan as they blindly sign a pile of loan documents. Firstly, be very clear of your requirement and do a thorough research of the product you want to buy. Then, if you find yourself in a situation where a bank official is trying to forcibly sell you a product, convey a clear message to him that you are aware of the RBI rules as an informed customer. If he tries to sell you a bundled product, refuse and tell him you can buy later individually as per your need. Most of the times when you show resilience, bank officials back out. If you still find that the bank official is reluctant and gives you no choice other than the bundled product, ask him to show the official notification which mandates the bundling of financial products. Alternatively, you can ask him to give the same in writing. If he refuses, let him know about your plan to approach another bank. If the bank is desperate for business, it would sell you the product you require without any conditions. In the case of home loan, some bank officials deliberately bring up the issue of life insurance during the final stage of loan agreement. After going through a long drawn out process and desperate for the deal to get over, you may end up buying whatever comes with the core loan product. So it is prudent to seek clarification with the bank in the initial stage of the agreement. Read the papers carefully before signing. 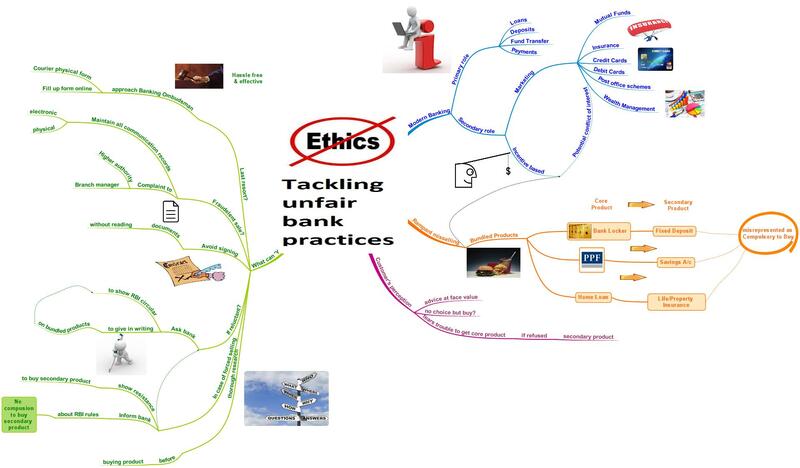 In case you find out the wrongdoing after buying a product, escalate the matter to the branch manager of the bank. Write a complaint letter to the higher authority and mail a copy to the concerned bank official also whom you were dealing with. Ensure that you maintain records of all communication, both electronic and physical. If your complaint is not acted upon by the bank, you can approach the banking ombudsman, the grievance redressal system of the government. It takes care of banking related complaints that include unfair selling practices. You can fill up a form online or courier the physical form to their postal address. It is a hassle free process and very effective. To conclude, a wrong financial product in your portfolio can prove to be very costly. It is thus prudent to remain cautious at the time of buying a product and read the fine print. In case you find yourself in a weak spot after a product is being sold to you fraudulently, do not let matters slip away. Confront bank officials and file a complaint. Be persistent in follow-ups and fight for a refund. After all, it is your hard earned money! The Joy of being Debt Free! Going cashless – the E-wallet way!